Across a range of social policy and domestic issues, the broader Republican and Democratic coalitions often find themselves at odds – and, at times, poles apart. But there are also notable divides within coalitions on issues such as abortion, marijuana, and energy. And while less common, consensus across groups also emerges on some questions of social and domestic policy. Not surprisingly, the deep divisions over the passage of major health care reform legislation last year are clearly visible in the 2011 political typology groups. Fully 80% of Staunch Conservatives say the health care law passed by Obama and Congress last year will have a mostly bad effect on health care in the U.S., and not a single Staunch Conservative interviewed thinks it will have a good effect. 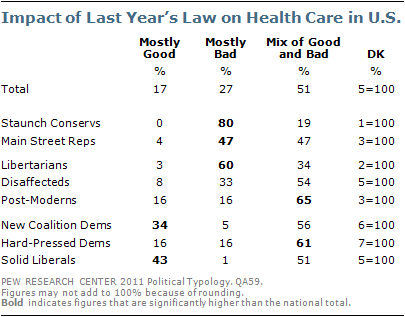 Opinion is nearly as negative among Libertarians, 60% of whom think the health care law will do more harm than good. While about half (47%) of Main Street Republicans also take a negative view of the law, an equal number say the effect of the law will be mixed. By contrast, there is no comparable unanimity that the law will have a mostly good effect among Democratic groups. Even among Solid Liberals, just 43% say the health care law will have a mostly good effect, while 51% say it will have a mix of good and bad effects on health care in the U.S. Hard-Pressed Democrats, in particular, are not convinced that the new health care law has clear benefits – a 61% majority says the law will have a mix of good and bad effects on health care in the country, and among the rest, as many say the impact will be mostly bad as mostly good (16% each). Post-Moderns offer, on balance, the same assessment of the law’s impact, while New Coalition Democrats are somewhat more positive – while 56% think the law will have a mixed effect, more say it will make things better rather than worse by a 34%-to-5% margin. While more Americans express a favorable view of labor unions (47%) than an unfavorable one (39%), there is a deeply partisan cast to these evaluations. Equally wide majorities in all three core Democratic groups view labor unions favorably, as do about half of the mostly independent Post-Moderns. The vast majority of Staunch Conservatives and Libertarians hold an unfavorable opinion of labor unions, as do about half of Main Street Republicans. The depth of negative sentiment toward unions is particularly notable among Staunch Conservatives. Not only do 74% view them unfavorably, but 44% say they have a “very unfavorable” opinion of labor unions. The public has a deeply ambivalent view of the impact Wall Street has on the American economy. Overall, 47% say Wall Street hurts the American economy more than helps it while 38% say it helps more that it hurts. Libertarians and Post-Moderns are the only groups where a majority says that Wall Street helps the economy more than it hurts. The groups that are the most likely to say that Wall Street hurts the economy more than it helps are Disaffecteds, Hard-Pressed Democrats and Solid Liberals – a majority in each group expresses this opinion. Views among Staunch Conservatives, Main Street Republicans and New Coalition Democrats are more divided. The reverse is true for Post-Moderns, who, along with Libertarians, are one of only two groups who have a predominantly positive view of Wall Street’s impact. Yet Post-Moderns tend to have negative views of business more generally, with 82% believing that large companies hold too much power in this country. A 54%-majority supports legal abortion in all or most cases, while slightly fewer (42%) say abortion should be illegal in all or most cases. 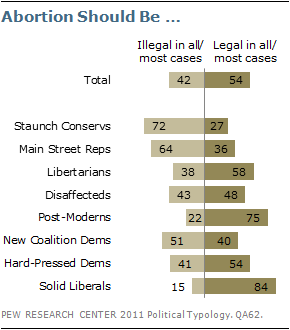 There is agreement in the two predominantly Republican typology groups on this issue, with majorities of both Staunch Conservatives (72%) and Main Street Republicans (64%) saying abortion should be illegal in all or most cases. But the two Republican-leaning independent groups take differing views: Libertarians are more likely to say abortion should be legal in all or most cases (58%) than illegal (38%), while Disaffecteds are divided in their views (48% legal, 43% illegal). Solid Liberals overwhelmingly support legal abortion in all or most cases (84%), as do three-quarters (75%) of Democratic-leaning Post-Moderns. But Hard-Pressed Democrats (54% legal, 41% illegal) and New Coalition Democrats (40% legal, 51% illegal) are much more divided in their views. Gay marriage divides the public, with 45% in favor of allowing gays and lesbians to marry legally and 46% opposed. And as with abortion, there are significant divisions within the Democratic base, as well as between Republican and Republican-leaning groups. Only one of the core Democratic groups – Solid Liberals – favors gay marriage (85% to 13%), while most New Coalition Democrats and Hard-Pressed Democrats are opposed (51%-34% and 57%-32%, respectively). The Democratic-leaning Post-Moderns favor gay marriage by a wide 80%-14% margin, aligning themselves with Solid Liberals on this issue. Broad majorities of both Staunch Conservatives (85% oppose) and Main Street Republicans (72% oppose) oppose gay marriage. By a less one-sided margin, more Disaffecteds also oppose (52%) than favor (34%) gay marriage. 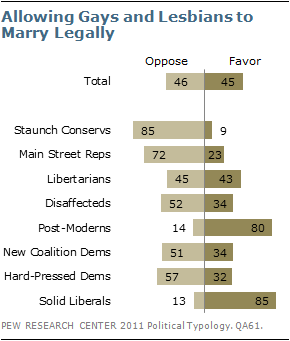 Libertarians are divided in their views; as many favor (43%) as oppose (45%) allowing gays and lesbians to marry legally. The question of the government’s role in protecting morality in society cuts across partisan typology groups. Overall, 54% of the public says the government is too involved in the issue of morality while 35% say the government should do more to protect morality in society. Just 11 points separate the views of Solid Liberals and Staunch Conservatives on this question; on balance, both groups say the government is too involved in morality (68% and 57%, respectively). Among all three independent-leaning groups, more say the government is too involved in the issue of morality than say it should be doing more to protect morality – including an overwhelming 77% of Libertarians. By contrast, New Coalition Democrats are the only group in which a greater percentage say the government should to do more to protect morality (54%) than say it is too involved (36%). In evaluating how three social trends – more gay and lesbian couples raising children, interracial marriage, and the practice of religions other than Christianity – affect the country, the two Republican typology groups show more cohesion than do the three Democratic groups. Staunch Conservatives and Main Street Republicans are united in viewing these changes as either a bad thing for society or as not making much difference – very few call these changes a good thing. Among the Democratic groups, Solid Liberals stand out for being more likely than New Coalition and Hard-Pressed Democrats to call these changes a good thing. In general, the three independent groups say most of these changes do not make much difference in American society. 48%-plurality says this trend doesn’t make much difference. Republican typology groups are united in viewing this change as a bad thing: 71% of Staunch Conservatives say this as do 56% of Main Street Republicans. There is more division among Democratic groups. Solid Liberals are by far the most supportive of this trend – 40% say it is a good thing for society. But among both Hard-Pressed and New Coalition Democrats, far more call it a bad thing for society than a good thing. As is the case on several other social issues, the predominantly independent Post-Moderns hold views that are more similar to the Solid Liberals than any other typology group. By a 20% to 9% margin, more Post-Moderns think more gay and lesbian couples raising children is good, not bad. Still, an overwhelming 66% say that this trend doesn’t make much difference for American society. 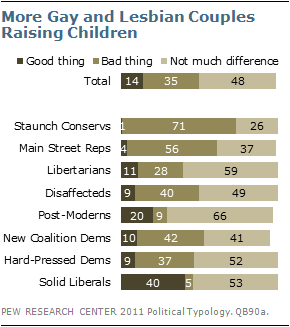 Most Libertarians (59%) also say a trend toward gays raising children doesn’t make much difference. Disaffecteds divide between not much difference (49%) and a bad thing for society (40%). When it comes to more people of different races marrying each other, the predominant view nationwide is neutral. About two-thirds (64%) say this trend does not make much difference for society, 25% call this a good thing and 9% a bad thing. This is the clear majority position across all typology groups –except Solid Liberals. Among that group, as many say this trend is a good thing for American society (47%) as say it doesn’t make any difference (50%). 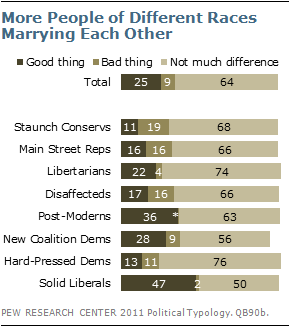 The view that more interracial marriage is good for society is also common among Post-Moderns (36%) and New Coalition Democrats (28%). Notably, four groups, including both of the predominantly Republican groups as well as the Disaffecteds and Hard-Pressed Democrats, are as likely to say a trend toward more racial intermarriage is bad for the country as to say it is a good thing. About half (51%) of the public say more people practicing religions other than Christianity does not make much difference to American society; 24% call this a good thing, 22% a bad thing. As with other social trends, Solid Liberals stand out in viewing this trend positively: 47% say greater religious diversity is good for American society. But again, both Hard-Pressed and New Coalition Democrats are less optimistic about this trend, with at least as many describing it as bad for the country as good. Majorities of all three independent groups say more people practicing religions other than Christianity does not make much difference. Among both Staunch Conservatives and Main Street Republicans, more see this as a bad thing for society than a good thing. There is widespread support across most typology groups for both a path to citizenship for illegal immigrants currently in the country and for stronger enforcement of immigration laws and border security. Majorities in seven of eight typology groups – all except Staunch Conservatives – favor providing a way for illegal immigrants in the U.S. to gain citizenship, if they pass background checks, pay fines and have jobs. Staunch Conservatives are evenly divided – with 49% in favor of a path to citizenship and the same number opposed. Support for a path to citizenship is stronger among Solid Liberals (94% favor) than other typology groups. Hard-Pressed Democrats express far less support for a path to citizenship than do other groups in the broad Democratic coalition: 61% favor a path to citizenship and 35% are opposed. While most Americans are open to reforming immigration laws to be more flexible toward illegal immigrants already in the country, the vast majority also supports stronger enforcement of immigration laws and border security. 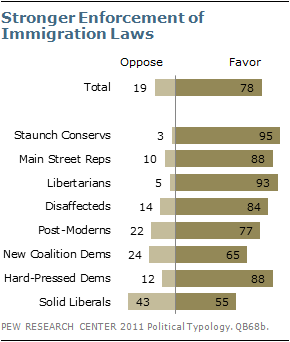 By a 78% to 19% margin, most Americans favor strengthening immigration enforcement. On this question, Solid Liberals diverge from most other groups: 55% favor stricter enforcement of stronger enforcement of immigration laws and border security, while 43% are opposed. Hard-Pressed Democrats support stronger enforcement by a wide margin (88% favor, 12% oppose), and as such are more in alignment with Republican groups than other Democratic groups. Most New Coalition Democrats favor stronger enforcement of immigration laws and border security, but their views are less one-sided (65% favor, 24% oppose). Substantial majorities of Republican and independent typology groups favor stronger enforcement of immigration laws, including 95% of Staunch Conservatives and 93% of Libertarians. Global warming remains a deeply partisan issue, but there is a consensus across six of the eight typology groups that developing alternative energy sources – as opposed to expanding the search for oil, coal, and natural gas – should be the priority for America’s energy supply. Nearly two-thirds of Americans (63%) say developing alternative sources such as wind, solar and hydrogen technology should be the more important priority for addressing America’s energy supply; 29% say expanding exploration and production of oil, coal and natural gas should be the more important priority. Staunch Conservatives are the only group in which a majority says expanding oil, coal and natural gas should be the priority; fully 72% say this should be the focus, while just 15% would emphasize alternative energy sources. The divide within the Republican base is stark on this issue: fully 66% of Main Street Republicans say alternative energy development should be the focus of America’s energy policy, while just 26% would focus on expanding oil, coal and natural gas exploration. 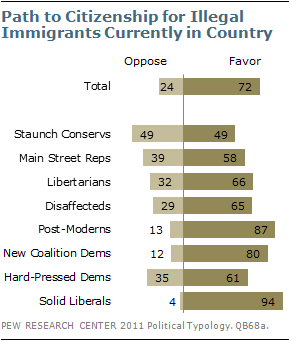 In this view, Main Street Republicans agree with the predominantly Democratic groups. Support for developing alternative energy is particularly strong among Solid Liberals (88%) and Post-Moderns (79%). 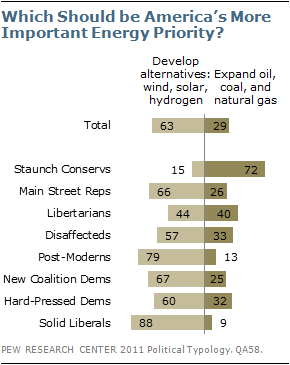 Libertarians are divided: 44% would focus on alternative energy and 40% on finding more oil, coal and natural gas. Opinions on global warming are far more polarized, with typology groups hewing to their partisan positions. Overall, 58% of the public says there is solid evidence that the average temperature on earth has been getting warmer over the past few decades while 34% say there is no solid evidence of warming. Just over a third (36%) say this warming is mostly because of human activity such as burning fossil fuels, while 18% say it is mostly because of natural patterns in the earth’s environment. Among Democratic typology groups, broad majorities of Solid Liberals (84%), New Coalition Democrats (77%), and Hard-Pressed Democrats (74%) say there is solid evidence that the earth’s average temperature has increased. And more in each group say that this warming is human-caused rather than a result of the earth’s natural patterns. Solid Liberals are much more likely to say this than are New Coalition and Hard-Pressed Democrats (70% vs. 50% and 42%, respectively). Opinion is the reverse among Staunch Conservatives and Main Street Republicans: Most say that there is no solid evidence of warming (75% and 55%, respectively). 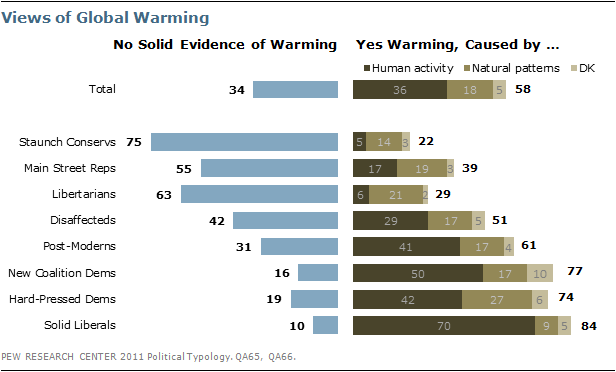 Among the minority that does see warming, just 5% and 17% respectively, see this warming as a result of human activity. Republican-leaning Libertarians share this perspective: 63% say the earth is not warming and hardly any say that warming exists and is being caused mostly by human activity (6%). Disaffecteds are divided in their views: 51% say there is solid evidence of warming, 42% say there is not. Among those who see warming, 29% of Disaffecteds say it is caused by human activity, while 17% say the earth’s natural patterns are the cause. Post-Moderns are nearly twice as likely to say the earth’s temperature is warming (61%) as not (31%); 41% say this warming is human-caused, compared with fewer (17%) who say it is the result of natural patterns. The public is divided over which is the more important priority: protecting the right of Americans to own guns (48%) or controlling gun ownership (47%). On this question the Republican and Republican-leaning typology groups follow their partisan dispositions and favor protecting the right to own guns; the Democratic and Democratic-leaning groups generally express more support for controlling gun ownership, but display somewhat more variance in opinion across groups. 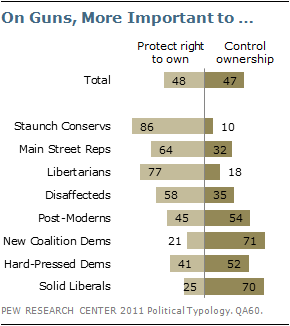 Overwhelming majorities of both Staunch Conservatives (86%) and Libertarians (77%) say that protecting the right of Americans to own guns is more important than controlling gun ownership. Significant majorities of Main Street Republicans (64%) and Disaffecteds (58%) agree. Among Democratic groups, broad majorities of Solid Liberals (70%) and New Coalition Democrats (71%) support controlling gun ownership. Hard-Pressed Democrats are more divided: 41% say protecting the right to own guns is more important, 52% say controlling gun ownership. The Democratic-leaning Post-Moderns are similarly divided: 45% say protecting the right to own guns is more important, 54% say controlling gun ownership. Half of Americans say the use of marijuana should be illegal, while nearly as many (45%) say it should be legal. The two Republican typology groups hold similar positions on this question with broad majorities opposed to legalization. Among the three independent and Democratic groups, there is more division of opinion. Two-thirds (66%) of Solid Liberals say marijuana should be legal, compared with 31% who think it should be illegal. In only two other groups does the balance of opinion tip toward legalization: Post-Moderns, who favor legalization by a 62% to 34% margin, and Libertarians, by a slimmer 54% to 43% margin. 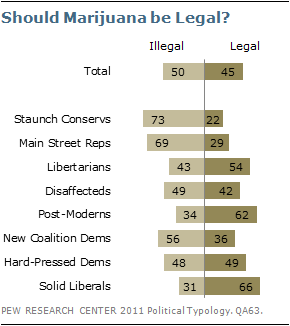 There is far less support for legalization among the two other Democratic groups. Hard-Pressed Democrats are divided, with 49% favoring legalization and 48% opposed. Among New Coalition Democrats, more think the use of marijuana should be illegal (56%) than legal (36%), placing them closer to the views of the core Republican groups. Most (57%) say the government should play a significant role in reducing obesity among children, while 39% say it should not. The broader Democratic coalition is united in saying the government should play a role in reducing obesity among children, while there are divides in the Republican coalition on this question. Wide majorities of Staunch Conservatives (78%) and Libertarians (72%) say the government should not play a significant role in combating childhood obesity. However, Main Street Republicans and Disaffecteds offer mixed views. 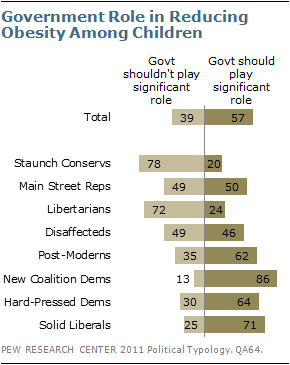 About as many Main Street Republicans say the government should play a role (50%) as say it should not (49%). Similarly, 46% of Disaffecteds say the government should be involved in reducing obesity among children; about as many (49%) say it should not be. Among Democratic coalition groups there is broad support for the government working to reduce obesity among children. Majorities of New Coalition Democrats (86%), Solid Liberals (71%), Hard-Pressed Democrats (64%), and Post-Moderns (62%) support a role for the government in reducing childhood obesity. Most (57%) say that public school libraries should be allowed to carry any books they want, while 39% say books with dangerous ideas should be banned from public schools. And this question, which draws on concerns about civil liberties, freedom of expression and security, does not cleave along traditional Democratic and Republican lines. Majorities in four of the eight typology groups oppose the idea of banning dangerous books. Solid Liberals overwhelmingly say public school libraries should be able to carry any books they want (82%-15%). The Democratic-leaning Post-Moderns (72%) and Republican-leaning Libertarians (69%) also think school libraries should carry any books they want. And, in a rare instance of agreement between the two most ideologically opposed groups, a 54%-majority of Staunch Conservatives also takes this view. Opinion is more divided in the four other typology groups. About equal percentages of Main Street Republicans say books with dangerous ideas should be banned (47%) as say school libraries should be able to carry any books they want (50%). Among Disaffecteds, 48% say dangerous books should be banned, while 44% say school libraries should carry what they want. 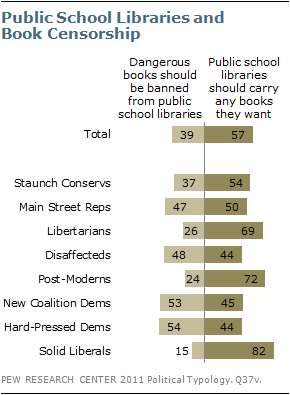 New Coalition and Hard-Pressed Democrats are also split on this question – in contrast with Solid Liberals, they tilt slightly toward banning books with dangerous ideas from public school libraries (53%-45% and 54%-44%, respectively).